​Do you Tweet? We always encourage #BCUG #NAVUG community members to pay it forward, share knowledge and information. All those hashtags can be helpful, but they also can be challenging for our large fingers on those small smart phone virtual keyboards. If you use an Apple iPhone or iPad to send your Tweets and other social medial posts, this tip can help you save some keystrokes. You can ceate some short codes to represent common hashtags and phrases like @NAVUG #NAVUGSummit or anything else that you include frequently in your posts. Simpy go to Settings, General, Keyboard and then Text Replacement on your i-device. Type the long phrase (including spaces) that you frequently use in the Phrase field and the short code that you would prefer to type in the shortcut field. 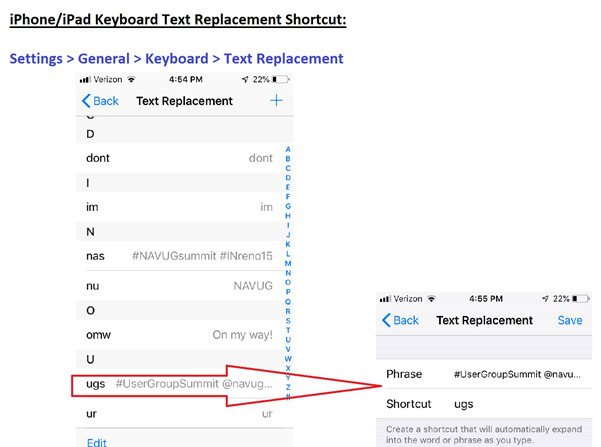 In the image below, I have set up a text replacement record so that when I type ugs, my iPhone will convert that to #UserGroupSummit @navug #BCUG #NAVUG. That’s quite a keystroke and time saver!